Happy Easter Friday! 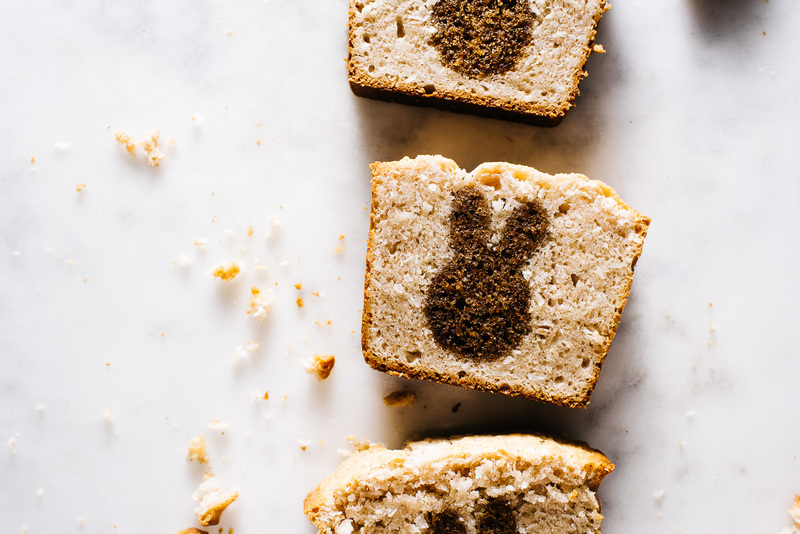 I don’t usually celebrate Easter, unless peeps topped cakes or potato buns count as a celebration…for the record, they definitely count in my books. We did have a little ham dinner yesterday! 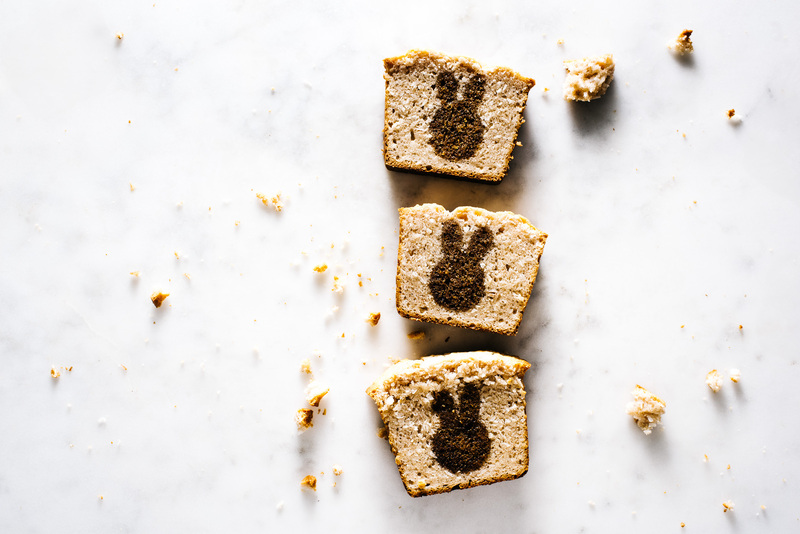 Mike made a spiced ham with the creamiest mash ever and I made some sweet potato biscuits and this surprise bunny-in-the-middle coconut and carrot loaf. I love coconut cake and carrot cake so I figured why not combine them into one loaf. I was a little worried that the carrot bunnies would get over-baked but they ended up being good! I am in love with loaves – they are so hot right now! Or at least I want them to be. They’re quick to make and you can eat a slice for breakfast, for afternoon tea, or with a scoop of ice cream for dessert. I love how they’re infinitely customizable and how little loaves are the perfect size for Mike and I.
Wishing you guys the happiest Easter! I hope you have an Easter egg hunt. It’s my dream to go on one even though I’m quite a bit older than most Easter egg hunters. One year, Mike very sweetly hid treats all over our home when I told him that Easter egg hunting was one of my unfulfilled childhood dreams. I’m pretty sure my mom and dad did take me to an Easter egg hunt or two, but for the life of me I cannot remember them so I’m pretty convinced I missed out on Easter as a kid. Although, now that I think about it, my very favorite stuffed animal as a child was an bunny that my dad bought me for Easter…so maybe I did do an Easter egg hunt or two? I still have my Bunny, oh-so-creatively named “Bunny.” She’s missing her tail and she’s rather grey now but I still love her. Ah, childhood nostalgia! Make the carrot cake: Preheat oven to 350°F. Line an 8×8 inch cake pan with parchment paper. In a bowl, whisk flour, baking soda, salt, cinnamon, and ginger. In another bowl, whisk sugar and oil in large bowl until well blended. 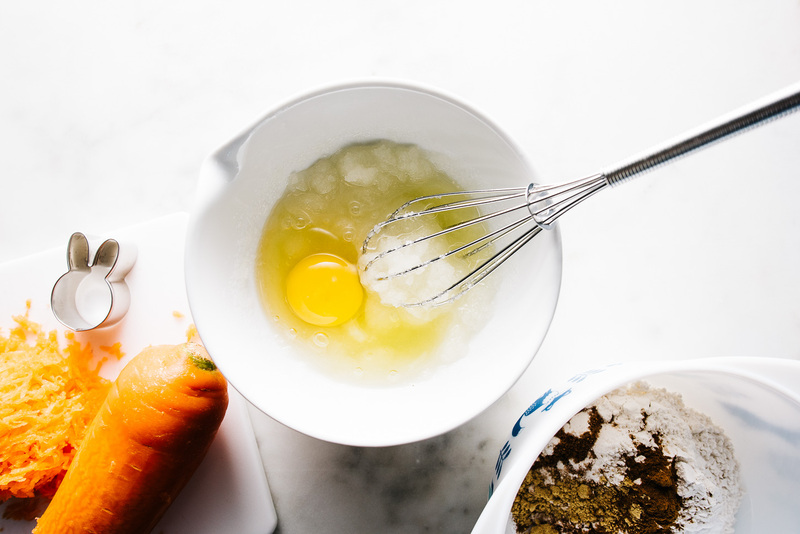 Whisk in eggs 1 at a time. Add flour mixture and stir until just blended. Stir in carrots and pour into the prepared pan. Bake for 40 minutes or until a tester comes out completely clean. Let cool in the pan for 15 minutes, the turn out onto a wire rack to cool completely. 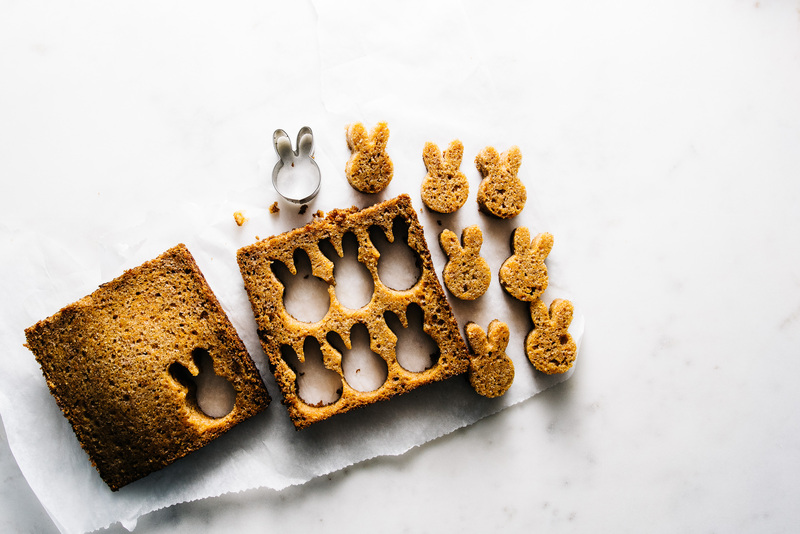 Wrap tightly in plastic wrap and place in the freezer to chill until slightly firm, then use a bunny cookie cutter to cut out as many bunnies as possible. Tightly wrap the bunnies and keep frozen while making the coconut batter. Make the coconut loaf: Whisk the egg, milk, and vanilla in a small bowl. Sift the flour, salt, baking power, and cinnamon into a medium bowl and mix with the sugar and coconut. Make a well in the center and add the egg mixture. Stir until just combined then add the melted butter and stir until smooth – do not overmix! Parchment line or oil/butter 2 small loaf pans – I used a 5.5 x 2.5 loaf pan. 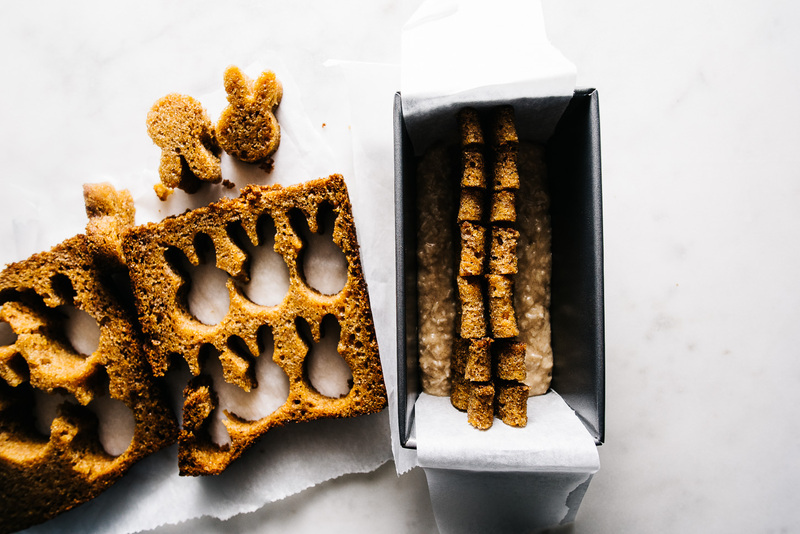 Place a bit of batter in the bottom of the pan and line up the frozen carrot bunnies into a bunny log. Place the bunnies snuggly in the pan and pour batter around and on top of the bunnies. Bake for 35-40 minutes, or until a toothpick inserted into the coconut part comes out clean. Let cool completely before slicing and enjoying! Omg, I love, love, LOVE this!!! So completely adorables and perfect for Easter! This is so cute! Where did you get the cookie cutter? This looks so cute and yummy! I remember one Easter when our mom’s took us to Stanley park to hunt for Easter eggs. The grass was glistening with a sea of shiny foil eggs. I recall us collecting eggs with all the other children, but then I recall our mom’s finding the chocolate eggs still in the packaging! I feel like our mom’s had more fun than we did that day! THE CUTEST LOAF THERE EVER WAS!!! Dying for this!! Oh my gosh, this is the cutest loaf! I love the bunnies! This is so cute! Did you use the same size loaf pan for both the carrot cake and the coconut cake? When you are making the coconut cake -is it just one pan or two that you are using? Your blog is always full of creative and inspiring ideas. i used a different size pan for the carrot cake – it will fit in an 8×8. you’ll get two mini coconut loaves out of this recipe. hope that clears it up a bit! LOL! Loaves? So hot right now. This is toooooo cute I can’t stand it. How’d you even stop yourself from nibbling on one or two of those bunnies?! Childhood nostalgia is the best! And this bunny loaf is so darling! 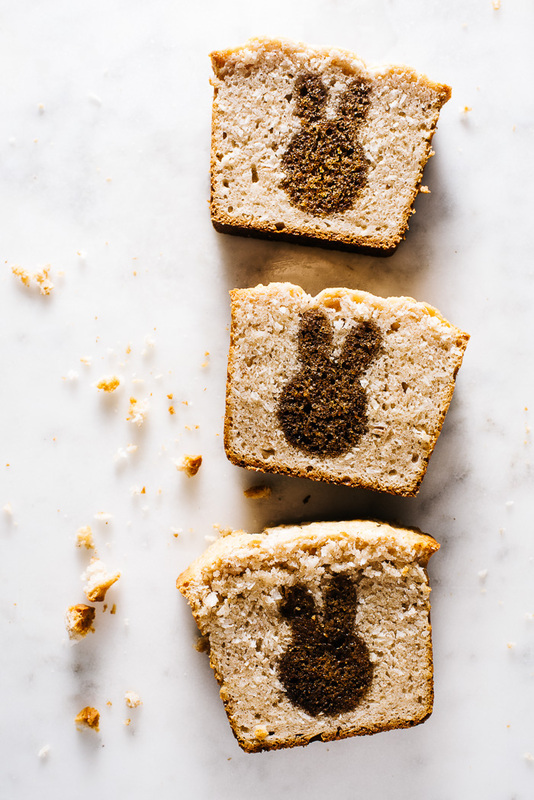 Love the recipe but my bunny and loaf did not have such a color contrast so it was not as easy to see! Any tips? Also does my bunny need to be completely frozen prior to assembly? How did you end up with 2 sheets of carrot cake？ I couldn’t slice my at all! Thanks in advance. the bunnies don’t need to be frozen, just chilled enough so that it’s easy to cut them. what size pan did you use to bake the bunnies? if you do it in an 8×8 pan you don’t need to slice the sheet in half. the thicker the bunnies are, the better. about the lack of color differentiation, i’m not sure what happened. did the coconut loaf come out completely brown and not white? I’ve always wondered how you get the shape inside the loaf! 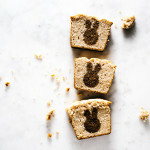 And I love the bunny cookie cutter… I have similar one that I used to make Mini Vanilla Pound Cake Easter Bunnies !! These are the cutest little things I have ever seen! I really love your creative approach at a tasty little Easter treat. Most people would’ve just made some sort of creme eegs cupcakes or something super rich, but these are just the opposite (in a good way). Too bad I saw these a little late for Easter. Maybe I could make the same recipe but put another little fun surprise inside. This is super cute and I am very excited to give it a try! However, would I be able to make one large loaf (in a standard 8 x 4.5 inch loaf pan), since I don’t have two small loaf pans? Or would it just completely not work that way? Let me know, hoping I can still make it! hi shannon – it should work. 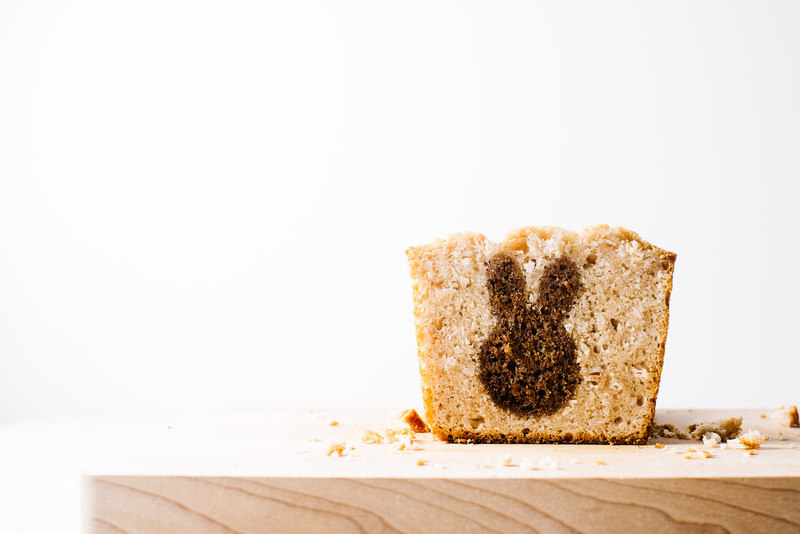 i didn’t do it in a larger pan because the bunny cutter i have isn’t big enough to make an impact in a large loaf. you’ll need to adjust the baking time, use the toothpick trick to make sure everything is baked through. hope that helps! So I got around to making this with the standard sized loaf pan, and I must say the loaf was absolutely delicious! The carrot and coconut complement each other beautifully, yet you can still taste the individual integrity of each component, and the loaf was perfectly moist. I had a different bunny cutter than the one pictured, but it ended up working for me, and turned out quite adorable! Since I used the 8″ x 4.5″ loaf pan, I did have to double the coconut loaf recipe; I tried with just one serving, but it wasn’t enough to cover the top and all of the sides of the bunnies, so I had to quickly whip up another batch upon discovering this. Since I wasn’t expecting to make a double batch of coconut loaf, I had used up all the unsweetened coconut, and only had sweetened left, but I found it didn’t detract from the overall flavor or make the loaf overly sweet (I do like sweet things though). I ended up having to bake the loaf for around 55 minutes (same temperature as the recipe called for), so if someone else were to try baking this loaf in a bigger pan I’d suggest baking for 50 – 55 minutes. Definitely a winning recipe, and everyone was very impressed with how cute and crafty it looked when complete! Equally cute and delicious, and I will be making this again for sure!